It’s hard to find someone who doesn’t like pizza. I remember fondly pizza night at our house when I was growing up. My Mom would buy “pizza set-ups” that included a pre-made pizza dough, pizza sauce, cheese, and sausage. S & T Provision the spot on the southwest side of Chicago that we bought them is still open. 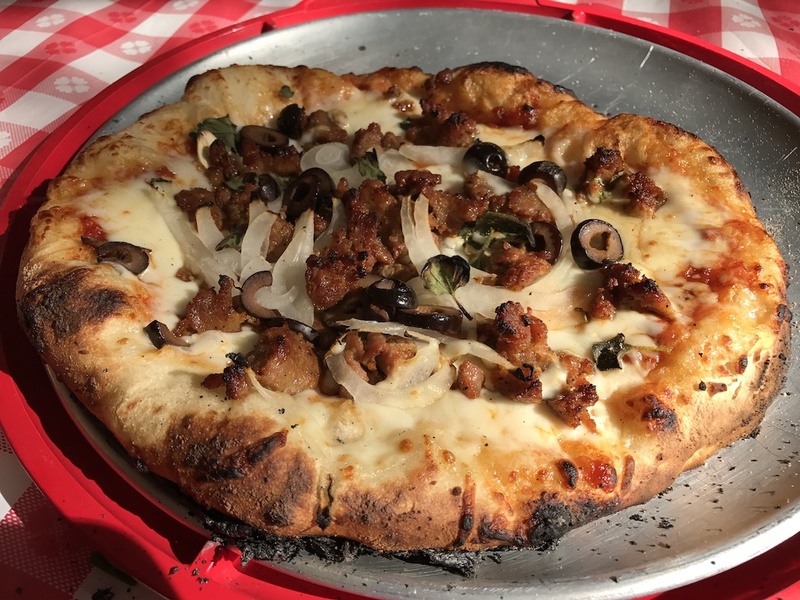 They sell these infamous pizza set-ups, Italian beef, meatballs and more. Nothing fancy just good food. I keep myself from going there again now that I’m an adult. I fear my memory of that pizza may not live up to how it may taste today. Many of us have tried to make pizza at home with limited success. Our home ovens don’t seem to get hot enough to get a good crispy thin crust without burning it. I even know a friend (an engineer) who tried to customize his home oven with bricks to retain the heat. It didn’t work and he needed to buy a new oven after that experiment. We’ve tried pizza stones and pizza ovens you put in your gas grill. None of them were perfect. 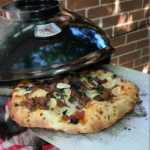 We have finally found a solution: the Pizzeria Pronto Outdoor Pizza Oven. This little oven is perfect for creating an instant pizza party. It’s easily portable and lightweight. All you do is hook it up to a propane tank, heat it up for 10 minutes and start cooking your pizzas. Check out this short video on the Pizzeria Pronto below. This little pizza oven is really amazing. It heats up to 700 degrees in about 5 minutes. No need for big prep or planning. All you need is pizza dough, pizza toppings, and a hungry crowd. Once you hook up the Pizzeria Pronto to your propane gas tank you turn it on, let it preheat and start cooking. The good news is that it takes about 5 minutes to cook a pizza. The oven stays nice and hot so there’s no need to wait. You can start cooking another one right away. The temperature indicator on the front of the oven lets you know how hot the oven is at all times. PRO TIP: Have your ingredients ready to go. Once you start making your pizzas in the oven they cook fast. Don’t let your guests wait too long! They also have a specialized pizza peel to make putting the pizza in the oven and taking it out much easier. Be sure to put some flour or cornmeal on the peel so the pizza slides off nice and easy onto the hot stones inside the oven. 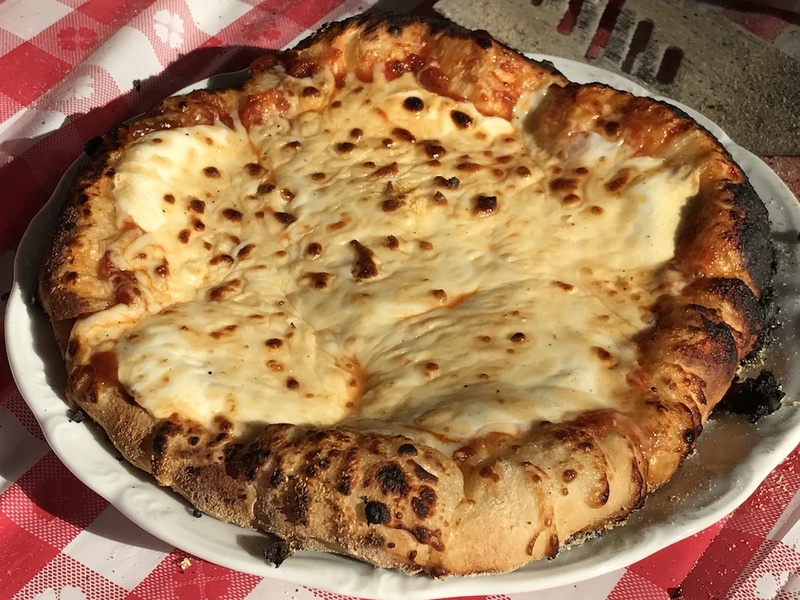 We started with an easy cheese pizza and it was delicious. I’m not gonna lie. Getting the hang of moving the pizza around in the relatively small oven takes some practice. Because the oven is so hot it’s easy to get some burnt edges if you’re not careful (or too busy sipping your cocktail). Some people like it that way, though so ask your guests! Veggie pizza anyone? The really fun part is that if you put out all your ingredients and spices your friends can customize their own pizzas. Everyone is a pizza chef with this fun little oven. Once you’ve had pizza you make yourself you won’t be ordering delivery pizza or buying frozen pizza again. It’s so fast, fresh and delicious. You can make your own pizza dough so special dietary requests like whole grain or gluten-free are a snap. Many local supermarkets also sell pre-made pizza dough so if you’re in a hurry those work just fine too. You’ll typically be able to get several pizzas out of the pre-made store dough. After you’ve enjoyed your homemade pizza with your friends splurge with some Italian desserts. It’s a perfect pairing! 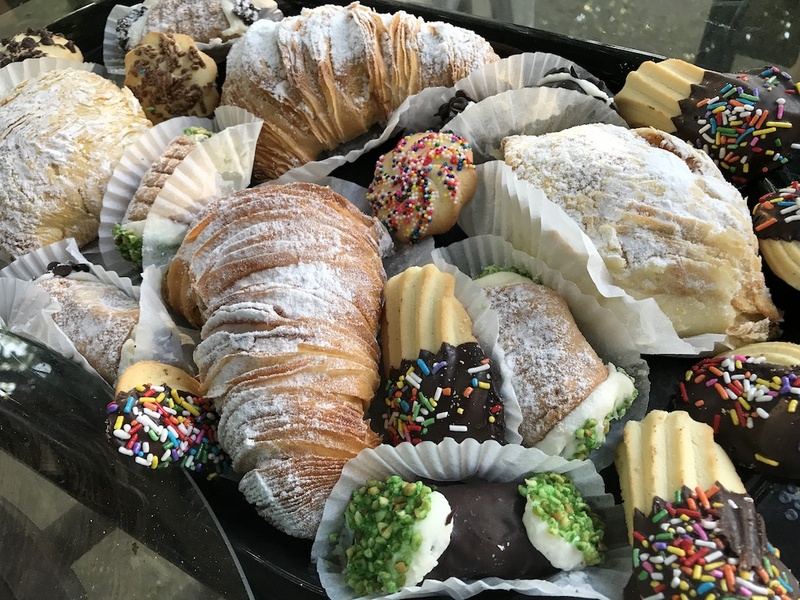 We were fortunate to have our Italian neighbors over for our first pizza party and they brought these wonderful Italian bakery goodies! So when friends ask what they can bring suggest dessert. That way you don’t have to worry about it. 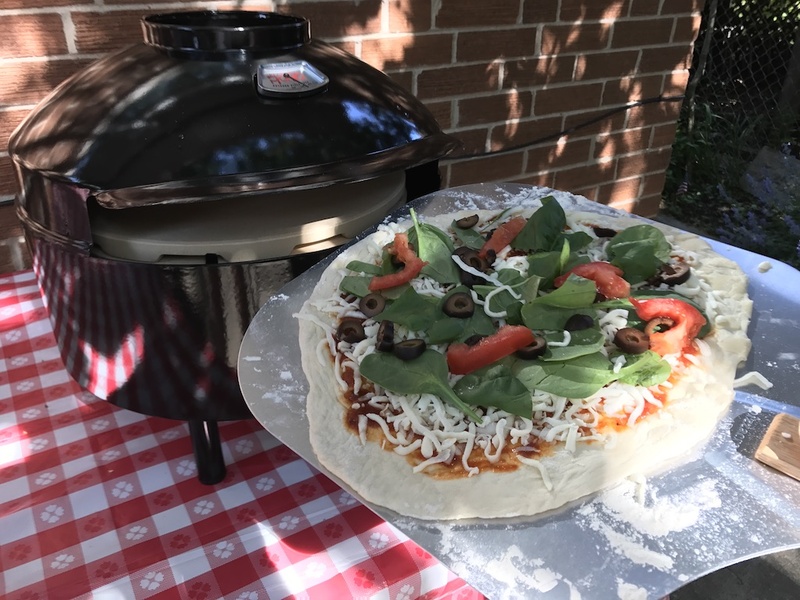 The good news about this pizza oven is that it’s so lightweight and portable it can be used for tailgate parties, camping or any other on-the-go party. It easily connects with a 1 lb. propane tank as well as a full-size tank. 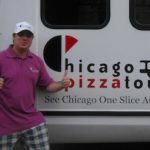 If you want to learn more about the Pizzeria Pronto Outdoor Pizza oven check out their website pizzacraft.com. 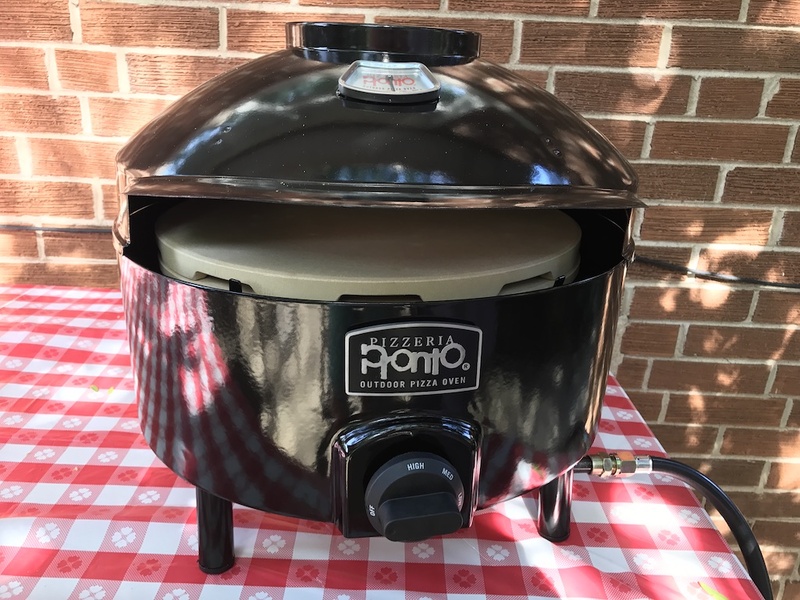 Don’t forget that these easy to use pizza ovens also make great gifts. Add one to your birthday or holiday list today. Thank you Pizzeria Pronto for sending us a sample pizza oven. We were not financially compensated for this review. All opinions we provide are our unique views and reflect our experiences. We pledge to provide our audience with truthful and honest reviews. Oh goodness me. How delicious does that look? What a great idea. This would be a perfect gift idea too. I know my husband would really appreciate something like this, as would my oldest who is seriously a pizza head. He eats it constantly! It looks so good. 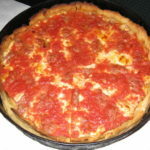 As someone who is from New Jersey and lived in NY as well as Chicago, I like to say I am a pizza snob. I have earned the title as I have eaten at some of the best as well as many of the worst. In the end I have decided to settle in Iowa, the land that food forgot! I would love to have something like this to try and recreate my favorite pizzas at home! I hear ya sister! The Pizzeria Pronto lets you decide what kind of pizza to make. Check it out! You’re right Ali the secret in the oven temperature. 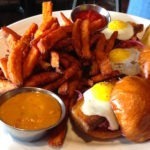 Hope you give Pizzeria Pronto a try. I’ve never heard of Pizzeria Pronto, I love that it’s lightweight and designed for outdoors. We have incredibly picky eaters in our house. With 5 of us, I love that this little oven only takes 5 minutes, so we could all have exactly what we want! What! How did I not know about this?? What a great item to put on a gift list this Christmas. I am totally telling my husband we need this. We do pizza night every week so it would be an item we would use a lot!!! Hi Censie! Sounds like Pizzeria Pronto is perfect for your pizza loving family! My son is a pizza fanatic! He would love to give this pizza oven a try! Your pizza’s look so good I literally want to take a lick 🙂 That is a good sign! What a great gift idea for the holidays. I had never heard of Pizzeria Pronto before. It’s wonderful! So easy to use and makes delicious pizza. Thanks for stopping by Melissa. I have wanted a wood fired pizza oven but didn’t want all the fuss. This is a great idea. The five minute cook time means that you can get a lot of pizza out in a little time. 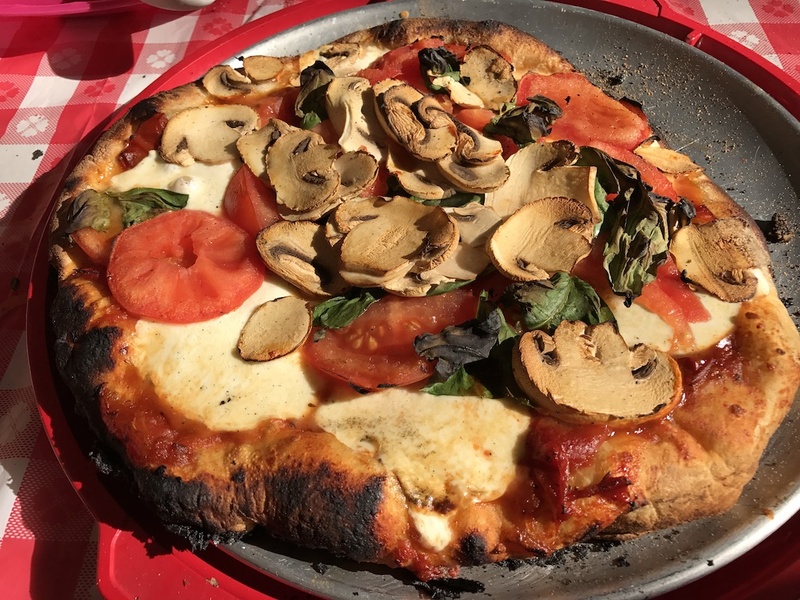 I love making my own dough too so this is a great addition to outdoor cooking. I bet I could whip up a gluten free vegan option too that will make the hard to feed crowd happy. We used to make our own pizza at home quite often. There is just something about homemade. Your pizzas look like great ideas, and the toppings look delicious too. Pizza at home is a great alternative to ordering out. Ordering out can take so long and come out so greasy! Using this to make pizza at home would also be a great way to get the kids involved. We haven’t attempted creating pizza at home. 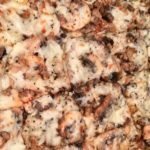 The idea of customizing your own toppings and ingredients is fun! 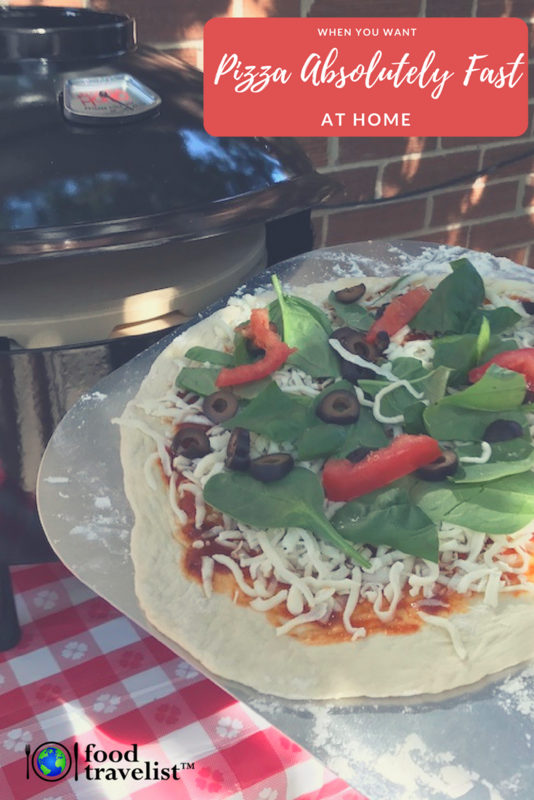 Having an outdoor pizza oven is a great way to make pizza for the family and it’s easy to use. Yum I love that hot, bubbly crust! We got a gourmet take and bake last night and it stunk our oven just didn’t cut it. I think it just didn’t cook evenly and the crust was too soft. I’d definitely try this-I love the idea of making pizza at home and my stepdaughter would enjoy it, too!